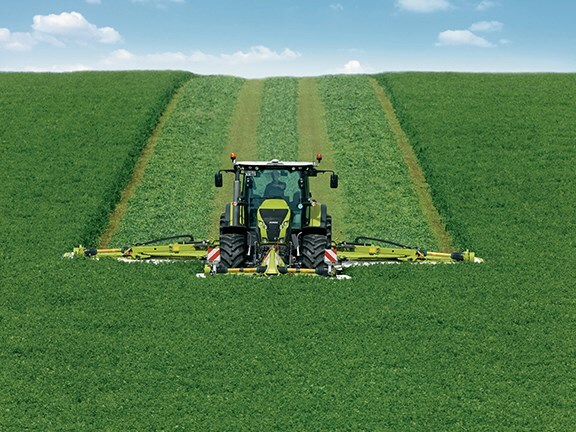 The Claas Disco 1100 Contour mower conditioner has a working width of 10.7m. The Claas Disco 1100 Contour tractor-mounted mower-conditioner has a working width of 10.7m, which will make it the largest on the market when it’s released in in early 2016. Using hydraulically-folding telescopic arm technology developed for the massive Claas Cougar self-propelled mower, the flagship Disco unit folds up to a transport width of less than 3m. Configurations include the company’s Max Cut cutterbar, which features a wave-shaped mower bed press-formed from a single piece of material. "This design allows the cutting discs to be positioned further forward, providing even better cutting quality under all conditions," Claas Harvest Centre Greenline product manager Luke Wheeler says. "The large tunnel opening between the cutterbar skids, as well as their special shape, improve the self-cleaning effect and thus ensure high forage quality." The cutterbar’s screw-fastening concept and continuous drive-component lubrication simplify maintenance and give the units a long service life, Wheeler adds. New features on the Contour models include clearly marked setting indicators, Kennfixx hydraulic couplings, an enhanced driveline with a redesigned headstock to facilitate hitching and, in larger models, an optional hydraulic transport catch. Also included is a built-in storage device that allows butterfly mower units to be stored in a space-saving vertical position. This is also an option on smaller three-point linkage mowers. While it’s packed with new features, the Max Cut also retains many from the previous P-Cut cutterbar, including a quick blade change system and the Safety Link safety module, which shears at a pre-determined breaking point in the event of a collision, Wheeler says. "The cutting disc is held in the module by a bolt and cannot fly off," he says. "The module can be replaced quickly and easily and the mower unit is therefore quickly ready for use again. "As before, the drive train of the Max Cut cutterbar is designed so that it can be run from 850 rpm, reducing fuel consumption by up to 20 per cent." 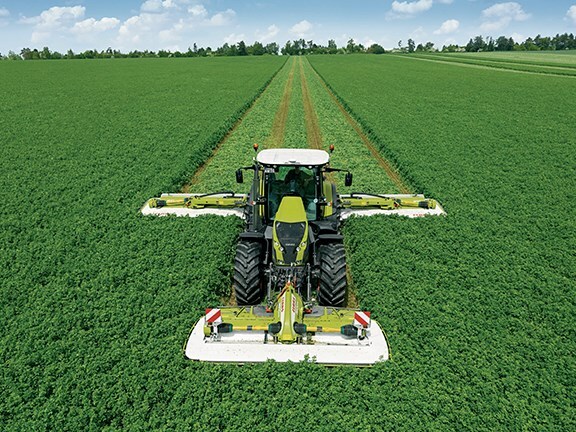 The Claas Disco 1100 Contour mower-conditioner folds up to a transport width of less than 3m. The revamped Disco series now includes 28 new front-mounted, rear-mounted and trailed models with operating widths from 2.6m to 10.7m. The mowers are available in five operational variants, all of which include Active Float hydro-pneumatic suspension. This suspension system ensures the mower is consistently suspended in relation to the ground, regardless of the position of the mower in relation to the tractor, Wheeler says, adding that "this is made possible by large-volume pressure accumulators connected to suspension cylinders, which can be adjusted from the driver’s seat to suit conditions". 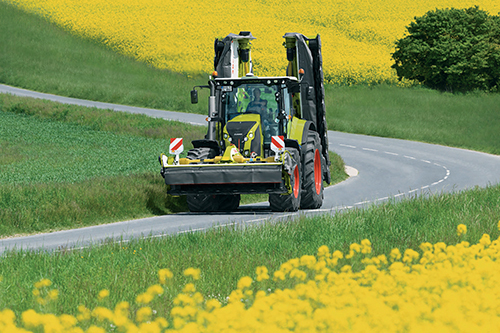 The Contour models are operated using the tractor's control devices, with pre-selection determined by using the Claas Operator or other Isobus-compatible control terminals. The Business, Duo and Autoswather variants are controlled using either the Operator or Communicator II control terminals, which Claas says allow fingertip control of key mower functions via the tractor’s multi-function lever. The simpler Trend models are operated using the tractor control devices without a control terminal and can be incorporated into the tractor's headland management, the company says. The optional individual lifting function is operated using a ball valve, which makes it possible to pre-select the mowing units. Wheeler says the Trend and Contour models are protected by a mechanical break-back lock to prevent collision damage. "If triggered, the mower unit moves backwards and up and is raised above the obstacle," he says. "To continue driving, the machine must be reversed slightly until the mechanical break-back lock is active again. "By comparison, the Business, Duo and Autoswather models are equipped with a hydraulic non-stop break-back lock, which enables the mower unit to swing back automatically without stopping." Click here to find mower conditioners for sale. Click here to look up mower conditioner specifications.